Canon Europe, world-leader in imaging solutions, announced the new imageFORMULA ScanFront 400, a high-performance standalone network scanner, expertly designed to capture a wide range of documents and feed into fast-paced business workflows. 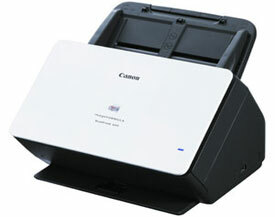 Canon launches imageFORMULA ScanFront 400: A high-performance network scanner for rapid document capture. The imageFORMULA ScanFront 400 allows for high-speed, versatile scanning of a wide range of documents including A4, A5, business cards and passports. Ultra-sonic double-feed detection with retry and release functionality also enables easy scanning of envelopes, booklets and folded documents. The sleek and compact desktop design makes it ideal for a variety of working applications, from a shared device in a back office or HR department to the decentralised scanning at customer service points within retail or banking environments. With rapid scanning speeds of up to 45 pages per minute, and a reliable 60-sheet feeding mechanism capable of handling up to 6,000 pages per day, the imageFORMULA ScanFront 400 can keep pace with the most demanding environments. The imageFORMULA ScanFront 400 creates and sends reliable scanning results faster and easier than ever before thanks to its Linux-based, easy-to-use interface and bright and responsive 10.1" touchscreen. With no PC or additional software required for operation, the device can be connected easily to a network for secure scanning to a combination of email, network folders, FTP, USB, fax or directly to a printer in just a few simple steps. Daily workloads can be further optimised thanks to the customisable job buttons which can be assigned to specific users and save frequently used functions and destinations, enabling error-free one-touch operation. The new device builds on Canon's impressive range of security features. In addition to the unique user permissions, security is provided on the device and document level. These include secure password log-in using active or LDAP directory and secure file sending using FTPS/SMTPS and SFTP protocol. Customised metadata index files can be created and sent with every scan, allowing for easy document classification and integration of the scanner into existing back office systems and workflows. Additionally, the web application SDK is available for system integrators, giving businesses the ability to integrate their own customisations or design bespoke applications. GJ Janse van Rensburg, product manager at Canon SA, said: "The new imageFORMULA ScanFront 400 scanner is built for modern working environments. Its simple usability alongside the scanner's advanced performance features, provides users with a reliable, versatile and quality scanning experience. With the compact size of this dedicated network scanner businesses can now provide a centrally managed, powerful scanning solution closer to the customers and at the same time save on the cost of any additional PC's, their licencing and maintenance." The imageFORMULA ScanFront 400 will be available across all Canon sales offices and selected distributors in South Africa from November 2016.